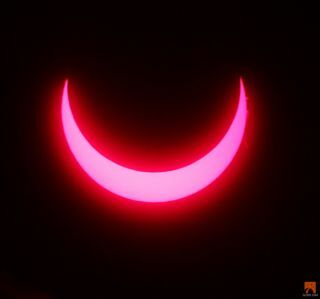 This image shows the annular solar eclipse of May 9, 2013, as seen through a solar telescope in Australia. The image is a still from video provided by the Slooh community telescope. The moon will block the sun in the first solar eclipse of the year on Tuesday (April 29), and stargazers in Australia have some of the best seats on the planet. But you don't have to be in the land Down Under to see the sun spectacle — you can watch it online for free. Weather permitting, the first solar eclipse of 2014 will appear as a partial solar eclipse to observers in Australia and southern Indonesia, with nearly 65 percent of the sun's disk obscured by the moon. It is the first of two solar eclipses this year and comes just two weeks after a dazzling total lunar eclipse on April 15. Two online skywatching groups — the Slooh community telescope and the Virtual Telescope Project — will provide live webcasts of the solar eclipse from Australia, beginning at 2 a.m. EDT (0600 GMT) on Tuesday. You can watch those solar eclipse webcasts live on Space.com. It will be Tuesday afternoon local time across Australia during the eclipse, with the sun setting before the event concludes. Tuesday's solar eclipse will be what scientists call an annular solar eclipse. The event, also known as a "ring of fire" solar eclipse, occurs when the sun is too far from Earth to completely obscure the sun's disk. The result is a bright ring of sunlight around the moon's silhouette, as viewed from the Earth's surface. But on Tuesday, the potentially dazzling "ring of fire" eclipse will only be visible from one uninhabited spot in Antarctica, where the only audience may be penguins on the frigid landscape. "This is a thoroughly bizarre eclipse," Slooh astronomer Bob Berman said in a statement. "When Slooh brings its live feeds from Australia, and we watch in real time as the inky black hemisphere of the moon partially obscures the sun, the greatest thrill might be an awareness of what's occurring — unseen by any human — in a tiny region of Antarctica." The April 29 solar eclipse will begin at 1:15 p.m. local time in Perth, the capital of Western Australia, and end at 3:59 p.m. local time. The time of greatest eclipse occurs at 2:41 p.m., when the moon will obscure about 65 percent of the solar disk. The event will begin later in the day for observers in Melbourne (3:58 p.m. local time) and Sydney (4:13 p.m.), with the sun setting before the eclipse ends. French amateur astronomer Xavier Jubier created an interactive Google map of how the solar eclipse will look from different parts of Australia, a tool that may be helpful for some Australian eclipse chasers. Slooh's webcast will be led by host Geoff Fox and Observatory Director Paul Cox, and feature guest expert Dr. Lucie Green, a BBC contributor and solar researcher at the Mullard Space Science Laboratory, UCL's Department of Space and Climate Physics. You can watch it live on Slooh.com or by downloading the Slooh iPad app. Viewers can ask questions during the show by using hashtag #Slooh. The Virtual Telescope Project webcast, led by astrophysicist Gianluca Masi in Ceccano, Italy, will provide views of Tuesday's solar eclipse with the help of a team of at least five astrophotographers located across Australia. Local Australians and photographers aren't the only ones hoping for good weather and great solar eclipse views on Tuesday. Astronomer Jay Pasachoff of Williams College in Williamstown, Mass. — a veteran 58 solar eclipses — will be observing the eclipse from Western Australia with colleague Robert Lucas. Pasachoff said he planned to photograph the solar eclipse with a Nikon 610 camera and some telephoto lens, while also meeting with the public to offer solar eclipse viewing advice. "My role at this eclipse is thus as Chair of the Working Group on Eclipses of the International Astronomical Union for public outreach and to advise people how to observe the eclipse safely and how not to be scared of it or by it," he wrote in an email. WARNING: Never look directly at the sun during an eclipse with a telescope or your unaided eye; severe eye damage can result. Scientists and amateur observers use special telescope filters or eclipse glasses to safely view the sun. "Even 1 percent of the sun is 10,000 times brighter than the moon, so during the annular eclipse, the sun is too bright to look at directly," Williams College officials wrote in an advisory. "If you have a special solar filter (or very dense welder's glass), or project the image onto another surface, you can detect that the sun is being covered by the moon." Tuesday's solar eclipse is the second eclipse of 2014 after the total lunar eclipse on April 15. The next total lunar eclipse will occur on Oct. 8 and will be primarily visible from the Pacific Ocean and tis bordering coastlines. A partial solar eclipse visible from most of the United States and parts of Canada will then follow on Oct. 23. Space.com staff writer Miriam Kramer contributed to this report. Email Tariq Malik at tmalik@space.com or follow him @tariqjmalik and Google+. Follow us @Spacedotcom, Facebook and Google+. Original article on Space.com.